Now closed for the winter season. See you in 2019! 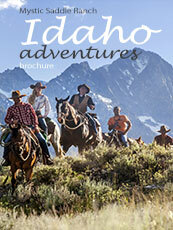 Enjoy an hour of horseback riding through mountain meadows, lodgepole pine forests, and along morainal ridges. This loop provides amazing views of the area and is a great introduction for beginner riders. Rides begin at 9:00am, 11:00am, 1:00pm, and 3:00pm daily. The 1.5hr loop is our most popular and most scenic ride at Redfish Lake Corrals! This loop rides along Little Redfish Lake and then cuts back into the timber before opening up to provide breathtaking views of the Sawtooth mountain range. The ride gains approximately 200 feet of elevation and also offers a scenic overlook of both Big and Little Redfish Lake. Riders may see eagles and Sandhill Cranes along Little Redfish Lake and may spot mule deer does and their fawns in the meadows and in the shade of the aspen trees. This loop is great for beginners and experienced riders. This ride climbs up on the Marshall Ridge for great close up views of Fishhook Creek Drainage, Mt. Heyburn, Horstman, Braxton, Thompson and Williams Peaks. It then descends Marshall Ridge through wooded aspen groves, and pops out on the ridge above Little Redfish Lake. This loop is slightly steeper than the 1.5hr and is great for intermediate and experienced riders. Tours begin at 8:30 am and 3:00 pm daily. The Bench Lakes ride leaves from the corral ascending the north morainal ridge above Redfish Lake to the Bench Lake turnoff. 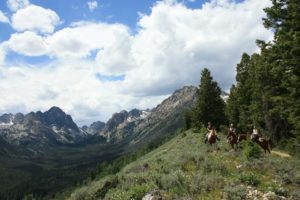 It then enters the Sawtooth Wilderness as it continues to climb the open-faced ridge providing great views of the Sawtooth peaks, the White Cloud Mountains, and the upper end of the Sawtooth Valley. The Bench Lakes are a series of five lakes; the destination is the largest of the five. There is time to get off the horse, enjoy, and photograph the amazing clarity of this lake, which is nestled under Heyburn Peak. This ride is excellent for intermediate to experienced riders. Bench Lakes rides leave at 8:30 am and 1:00 pm daily. 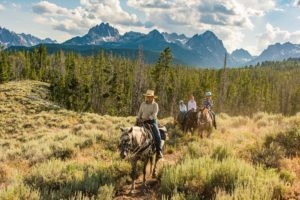 Enjoy this beautiful ride with views of Redfish Lake, mountain meadows and the Sawtooth Mountains. Marshall Lake is a small lake nestled under Williams Peak and has fishing available for the angler. Upper Marshall Lake can be hiked to during your lunch break. Upper Marshall is one of the lakes that take a little effort to get to but well worth it. Your have time at the lake to really get a feel for being in the Wilderness with breathtaking views and a spectacular lake. This ride is perfect for beginners and intermediate riders. Give us a call! We may be able to combine groups! About a 5 mile ride one way to one of the most beautiful high mountain lakes in the Sawtooth range. The last mile between Alpine Lake and Sawtooth Lake is not for the faint at heart, with steep switchbacks reaching up the mountain side to deliver you to the hanging valley of Sawtooth Lake. Meet us at the trailhead at Iron Creek Campground, 4 miles out of Stanley on Highway 21. This trail is great for intermediate riders. 5 miles ride each way. Our easiest ride through wooded terrain to Hell Roaring Lake which is beautiful and pristine. The trail takes you through lodgepole pine forest and along the spectacular Hell Roaring Creek. 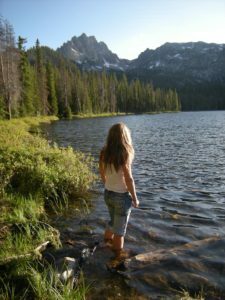 The trail takes you to Hell Roaring lake which is gorgeous and nestled below majestic Sawtooth peaks. This ride is great for beginners as it has little elevation gain and easy terrain. The. Trailhead at Decker Flat Road, 15 miles south of Stanley on Highway 75. 6.5 miles one way. Probably our most spectacular ride and our most challenging. Spectacular views, mountain meadows, high mountain lakes and a real memory maker. This trail has several creek crossings and provides amazing views the whole way. Trailhead at Pettit Lake, 18 miles south of Stanley on Highway 75. This ride is great for intermediate and more experienced riders. 4 miles one way. Bench Lakes ride leaves from the corral ascending the north morainal ridge above Redfish Lake to the Bench Lake turnoff. 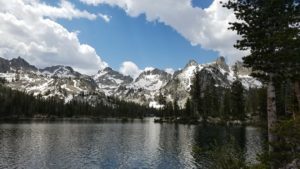 You then enter the Sawtooth Wilderness as you continue to climb the open-faced ridge providing great views of Heyburn Peak, Grand Mogul, the White Cloud Mtns., and the upper end of the Sawtooth Valley. Bench Lake is a series of five lakes; our destination is the largest of the five, which is the second lake. We take time to get off the horse, enjoy, and photograph the amazing clarity of this lake, reflecting back the grandeur of Heyburn Peak. Time for fishing, play time, and lunch before we return to our horses. The return journey takes us through the Douglas Fir and Lodge pole Pine ecosystems. Watch the boats go by on Redfish Lake below or keep an eye out for Osprey as they catch the uplifting winds. This ride is perfect for beginners and those who want to spend the most time at the lake as possible. Children under the age of eighteen must have a parent or legal guardian sign the assumption of risk waiver prior to riding. We recommend wearing pants and closed-toe shoes. Please bring a camera and water bottles for your ride. Bringing a jacket, sun screen and bug spray is a great idea. All our horses are equipped with saddle bags to help carry your gear!